Jupiter transit to Libra 2017 prediction for Gemini Sign - Guru peyarchi palangal 2017 for Mithuna Rasi as per Thirukanitha Panchangam. Jupiter transit to Libra sign would happen on September 2nd, 2017 and stay there until October 4th, 2018. Let us analyze Guru Peyarchi 2017 prediction in detail for Mithuna Rasi, so we can know what to expect. The Gemini is the third house in the Zodiac Sign. The Nakshatras or stars Mrigashiriksha (Pada 3 and 4), Thiruvadhirai and Punarpoosham (Pada 1, 2, and 3) come under the Gemini Zodiac sign. Lord Mercury is the ruler of this moon sign. People born under any of this Nakshatra have Gemini as their moon sign. Lord Jupiter is ruler for your 7th House which deals with the career. The transition this year will bring you mediocre benefits. Lord Jupiter will transit from the House of Virgo to the House of Libra on September 2, 2017, and stay there until October 4, 2018. For the past one year, the presence of Lord Jupiter in your 4th House had brought nothing but troubles for you. Let us take a look at the past predictions. Last year, many Gemini Rasi students had transferred to other schools or colleges. Those working would have had a change of location or a new job or a change of office. Opportunities for a career abroad would have come by. Some might have undergone hospitalization themselves. Some even had lost their jobs. Lord Jupiter who had been hitting you hard this way is now transiting, which will come as a relief to you. On September 2, 2017, Lord Jupiter will transit to the Libra moon sign, which is a friendly sign to you. This will usher in welcome changes to your life. Lord Jupiter will now house in your 5th House, which is quite good. The 5th House deals with children. Hence the overall life of your children- their studies, jobs, and marriages will take place well. Also, Lord Jupiter aspects your 9th House (House of Aquarius also your House of charity/House of Paternal side) with His 5th part gaze. This is beneficial and you will be charitable and take part in many social welfare activities with the blessings of your elders and father. Your father’s support will be there for you. His health will improve and you will receive properties and help from your paternal side. 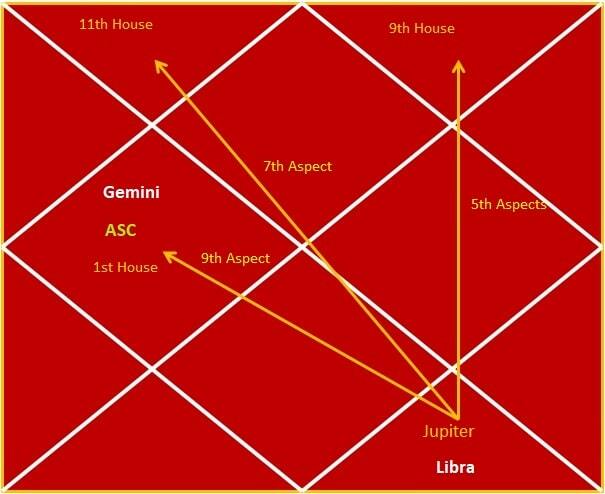 In addition, Lord Jupiter aspects your own house (Gemini Sign) with His 9th part gaze, from the House of Libra. Due to this, any ailments bothering you will reduce their intensity, your travails will come down and your peace of mind will rise up. Your heart will be filled with joy and happiness and confidence. Anything you desire will come through. Students will shine in their studies. They will succeed in all examinations with flying colors. Those working without remuneration will receive them. Cash flow will be good. Promotions and income hikes come in your way. The Geminis awaiting marriage will get married this year. Your love will mature and your relationship might result in a fruitful marriage. Childless couples will be blessed with children. Your expenses will come down while your income increases. Your children will excel in their studies and their marriages will take place well. Your father’s health will improve. Your paternal side will come to your aid. Some of your paternal ancestral wealth will come to you. You will take part in charitable work. Your pilgrimages will be successful. Your elder siblings will have a good year ahead, with promotions, marriages, children, etc. Last year, your health had taken a turn for the worse. This year, your health will improve well. The transit of Lord Jupiter will bring in many good changes for you.